Everyone knows of goats’ mythical appetites — that’s why they’re killer for clearing brush and invasive weeds. But set them loose on an island, mating and eating everything in sight, and goats can become a high-level nuisance. On the Galapagos Islands, the fabled archipelago where Darwin saw his finches, a drastic policy has been in place for decades — kill every goat. Goats were not native to Galapagos (bats and rice rats are the only native mammals.) They make awful island tenants, similar to rabbits, deer and wild pigs. Goats breed fast, have few known predators — none on Galapagos — and are indiscriminate eaters. On a chain of islands known for its delicate ecology, they threaten to ruin everything. In 1959, fishermen released three goats on the island of Pinta. The men planned to hunt goat when need arose (little faith in their own fishing abilities, apparently). By the 1970s, three goats had turned into 40,000; vegetation on the 60-kilometer island was dismal. By 1997, the Galapagos goat population had reached six figures. To fight back, a massive, multi-agency project called Project Isabela was launched. The operation bordered on paramilitary — platoons of goat-hunters scoured three islands, on foot and in helicopters. The method of killing? A clean shot to the head or the heart. After being shot, the goat corpses were left to rot. Wasteful, but consider the reasoning — the goats had consumed valuable island nutrients. Exporting their meat would remove these nutrients from the island forever. “It could be very destructive, like removing 10,000 trees from a rainforest,” Campbell says. “Better to let the bodies decompose into the soil.” A handful of goats were consumed by the eradication team, but not many. Platoons of goat-hunters scoured the islands, on foot and in helicopters. The method of killing? A clean shot to the head or the heart. Judas goats were sterilized and injected with hormones to make them permanently in estrus (heat). These unwitting traitors were then set free around the islands, irresistible bait for the fugitives. 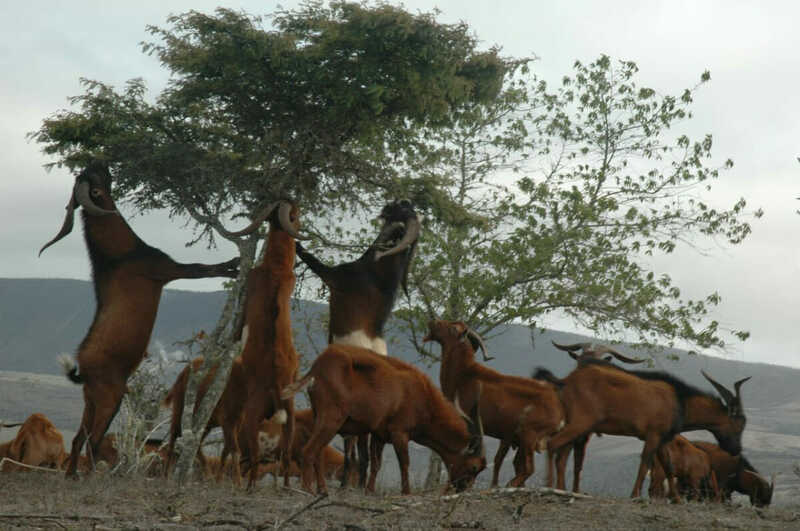 By 2006, Project Isabela had eliminated all goats from the target areas. Still, Galapagos’ goat problems persist on three islands today. The issue would seem to be marketing-related — some residents of these islands like to hunt goats for food. Cayot says it’s been tough persuading them to embrace total extermination.